Today on The Book Zone, as part of U14s Only Month, we are joined by Jenni (aka @JuniperJungle on Twitter). Jenni runs the fab Juniper's Jungle blog, works with kids as Beaver leader and is also currently studying to be a librarian. Jenni wanted to write a review about a book she had recently and loved. It is a book that has been sitting on my own TBR pile for some time, but always gets overlooked as like Jenni I have never been a fan of talking animal stories. Based on Jenni's glowing review, I may now have to overlook this general dislike and give Atticus Claw a chance. Thanks Jenni for taking the time to write this for us! Meet Atticus Grammatticus Cattypus Claw, the world's greatest cat burglar. He's a tabby who spells trouble. And he's been hired by the fiendish Jimmy Magpie to steal all the jewels in Littleton-on-Sea. Atticus needs a temporary home - preferably one with lots of sardines provided. 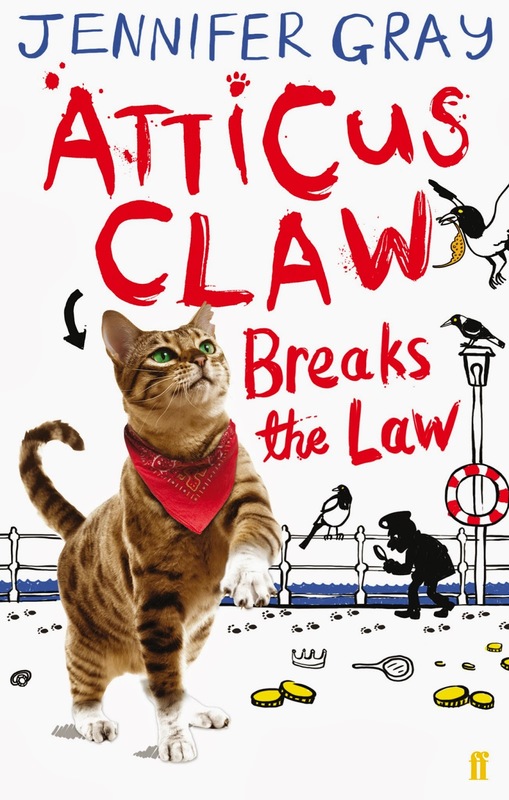 But when he adopts Inspector Cheddar and his family, Atticus starts to wonder, is a life of crime really for him? When I was a child I read pretty much anything, but with only a handful of exceptions stories with talking animals did not please me. I'm so pleased I've left this particular reading quirk behind - I wouldn't want to think I might have missed out on reading this gem of a book. 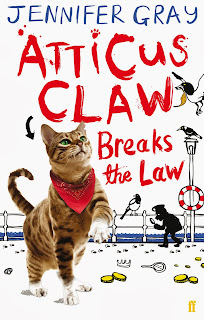 Atticus Claw Breaks the Law is full of talking animals, and mighty fine talking animals they are. Well, Atticus Claw is mighty fine, the dreadful gang of magpies are downright villains that reminded me of the hyenas in The Lion King on more than one occasion. Regardless of whether they're on the side of right or wrong the animal characters in this book are all well created, vivid characters. The humans in the book are equally strong creations, the Cheddar family with Mrs Tucker the tall-tale telling childminder leap off the page - I frequently found myself imagining that I was sitting at their kitchen table with them, watching the events of the story unfold. The humans that made me laugh the most though were Lord and Lady Tofty, a pair of Hyacinth Bucket style aristocrats. They are ludicrous and caricatureish but in the best possible way. The main storyline of Atticus being hired by the magpies to act out their revenge on the humans is well thought out and believable, the motivations of the characters are clear and understandable even when the double crossing begins. This plays neatly with the sub plot lines of Inspector Cheddar wanting to prove himself as a policeman and Mrs Cheddar trying to organise a tv antiques valuation day - you can start to see how the plotlines are going to twist around one another and the eventual payoff is incredibly satisfying. There is loads of humour in this book, in addition to the obvious laugh out loud moments there are many instances of wordplay that left me absolutely delighted. I think this book would work really well as a read aloud book, both to a group of children or on a more individual basis. It has broad appeal, there is something for everyone to enjoy, and best of all it's the first in a series so there are plenty more adventures to look forward to (there are 3 so far with more to come). edit: Rather embarrassingly, this is now a day late, and I've only just realised. Thanks a million Blogger and your occasionally rubbish scheduling facility! However, it does give me the opportunity to say I totally loved The Day of the Doctor. I think that Steven Moffat got it exactly right (for a change) and it was the perfect celebration of a TV series I have been watching since I was five or six. And Tom Baker too as the Great Curator - genius! Happy Anniversary Doctor Who! You have been a part of my life for nigh on 36 years (give or take, and apart from the wilderness years following Michael Grade's and Jonathan Powell's assassination of the show, when my only fix was the few episodes I owned on VHS) and whilst occasionally you have disappointed, I have been more than happy to stick with you through thick and thin. I'm really not sure how old I was when I first started watching Doctor Who as in those days there must have been many reruns on BBC2, as I have definite memories of watching episodes featuring William Hartnell and Patrick Troughton (both first broadcast before I was born) and Jon Pertwee, whose episodes were first shown when I would have been too young to watch them or remember them. Tom Baker, then, was MY Doctor and I have very vivid memories of many of his episodes, probably starting around 1976 (I definitely remember watching and possibly being a little scared by The Talons of Weng-Chiang). After that, it was pretty much must-watch TV in our household for many years after (yes, even through the Bonnie Langford years *shudder*) and I have memories of scaring the bejesus out of my little brother on many occasions following the final episode of The Keeper of Traken, as my sister and I would sister and I would jump out on him from dark rooms at any given opportunity, repeating The Master's words: "A new body... at last!". However, not only did I watch a lot of Doctor Who, as a 9+ year old I was an avid reader of the books that were published at the time by Target. I had quite a collection (usually picked up from jumble sales), and I thought they had been lost/given away long ago until I found a pile of them in a box in my mother's loft last year (a few of them are pictured above). I would also regularly borrow piles of them from my wonderful local libraries, and chain read them, ready to take them back a few weeks later in exchange for more. I decided to celebrate the 50th Anniversary in my own way this weekend, by watching a couple of my favourite Tom Baker episodes, as well as reading a couple of these books. Do they stand the test of time? Well they date pretty well: Doctor Who and the Cybermen only falls a little flat because when compared with the amazing books written for kids today it is all action and no characterisation, but then again that is how Gerry Davis wrote his Doctor Who books - his intention was just to recapture the story that had taken place on screen. Next I turned to one of my all time favourite Doctor Who stories, both on TV and in print - Doctor Who and the Daemons - and it still does not disappoint. Next, I'm going to dive into another favourite - the aforementioned The Talons of Weng-Chiang. If you have an aged 9+ child who loves Doctor Who then you could do a lot worse then get your hands on some of these books. = In 2012 BBC Books re-released a good number of these classic Doctor Who stories that featured the first four incarnations of The Doctor (I'm not sure if they re-released any of the Peter Davison era books). These can each be bought off Amazon for less than the price of a couple of pints, and would make excellent Christmas stocking presents for young fans. Doctor Who books, both classic and more recent, are especially great for fans who are reluctant readers, as they aren't too challenging, but are invariably action-packed, fun reads that Under 14s will love. There are a huge number of Doctor Who books published these days, and I have to admit that I stopped reading these some years ago. However, I was very excited recently to receive a wonderful volume of short stories, published by Puffin to celebrate the 50th Anniversary. 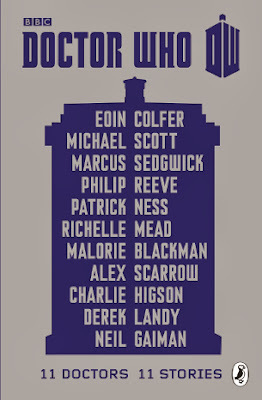 It's called Doctor Who: 11 Doctors, 11 Stories and features shorts by the likes of Malorie Blackman, Eoin Colfer, Philip Reeve, Alex Scarrow and Derek Landy, and I am really looking forward to reading it over the next few weeks, as I dive in between other books. Before I sign off I just want to make a quick mention about a very special project that is taking place in the Uk at the moment called Target Who. Target Who are a group of lifelong Doctor Who fans who bought 11,000 Target Doctor Who books in an ebay auction. This wasn't 11,000 different titles, but actually multiple copies of 36 titles, including classics like Doctor Who and the Daleks and Doctor Who and the Cybermen, which had been discovered wrapped up in some warehouse or something. Target Who did not purchase the books for themselves - they bought them in order to send free copies out to schools around the country. You can read more about the project here. 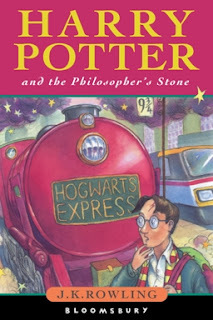 So far they have sent out more than 4000 books to school libraries, and in doing so have inspired individuals to get involved, and so others around the UK (and possibly the world) have been donating individual copies to school libraries, thus ensuring that these classic stories live on. You can follow their amazing work on their blog, and also follow them on twitter as @targetwho. edit (02/12/13): This competition is now closed. The winner is Jane Clarke. 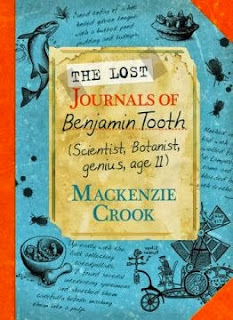 On Sunday I posted a review of The Lost Journals of Benjamin Tooth by Mackenzie Crook. Now, thanks to the lovely people at Faber, you have the chance to win a signed first edition hardback of its predecessor - The Windvale Sprites - simply by filling in your details in the form below. The first name drawn at random after the closing date will win a copy of the book. The deadline for entries is 7pm GMT Tuesday 26th November. This competition is open to UK residents only. Neither the publisher or I will be held responsible for items lost in the mail. Today for Under 14s Only Month we are joined by Sarah Bryars who has very kindly written a review for a book by one of her favourite fantasy writers, the late, great Diana Wynne Jones. For those of you who don't know Sarah (aka @Esssjay on Twitter), she was one of the co-writers of the brilliant My Favourite Books blog before it shut shop at the end of 2012, and Sarah has since been concentrating on her own writing. My love for Diana Wynne Jones started with The Merlin Conspiracy. I’ve read a lot of books about magic and adventure but nobody does it quite like her. Romanov, one of her characters, says, “Magic is wide, various and big,” which sort of sums her work up – it’s hard to put into words what makes her so special. 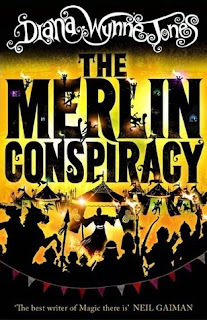 The Merlin Conspiracy follows two stories that eventually join up. The first is Roddy’s. She lives in the land of Blest, which is a mirror version of our own with identical place names. However, she’s a part of the travelling court called the Progress which contains the King and the incredibly important Merlin who go from place to place to ensure the stability of the land. But Merlin dies mysteriously and there’s something weird about his replacement. Suspicious, Roddy and her friend Grundo discovers that something terrible is happening and an awful plot is underway. Meanwhile, Nick is very much based in our world although he’s desperate to step out of it. When at a writing convention in London he’s nudged sideways and finds himself in what he thinks is a dream world. After some false turns, a brush or two with death and a meeting with an elephant Nick learns of Roddy’s problems in Blest and promises to help. Meanwhile, in Blest, Roddy gets left behind by the Progress. With no adults to help her or her friend Grundo they have to be resourceful. Nick and Roddy have to find a way to sort out the Merlin Conspiracy and restore order to the land. Diana Wynne Jones is one of those writers who can manage a vast plot and all its many unravellings without making you feel nervous. Even though at times I felt that I was never going to get out of depths of this parallel universe she always finds a way to both steer you through but remind you of the heart of the story. Her characters don’t need wands or set rules but instead have an acceptance of the wild nature of myth and magic. I don’t know how she does it but her books are very special things. In fact, my copy of The Merlin Conspiracy came from my library where I work. When it was taken off the shelves for being too battered I adopted it and took it home. The fact that its pages are yellow and falling out make it even more special. Okay, I’m aware I sound a bit mad now with the book adopting but it’s what I do. The Merlin Conspiracy is a companion novel to Deep Secret but you don’t have to have read it to enjoy this one. When the Merlin of Blest dies, everyone thinks it's a natural death. But Roddy and Grundo, two children traveling with the Royal Court, soon discover the truth. The Merlin's replacement and other courtiers are scheming to steal the magic of Blest for their own purposes. Huge thanks to Sarah for taking part in Under 14s Only Month. I have to admit, although I have read and loved a number of Diana's books this is one that has eluded me but based on Sarah's review I think I'm going to have to hunt out the copy that I am sure I have got hidden away somewhere. 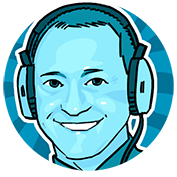 Watch this space for at least one more (and hopefully more) guest reviews this month. My name is Benjamin Tooth. This is my journal. I was very fortunate to be sent The Lost Journals of Benjamin Tooth and its predecessor, The Windvale Sprites, both by Mackenzie Crook, in the same package by the lovely people at Faber. The Windvale Sprites was published two years ago, and received many rave reviews for its humour, charm and old school story telling magic. It told the story of Asa, a young boy who spots the remains of an unusual creature after the great storm that hit the UK back in 1987. His curiosity suitably piqued, Asa embarks on a mission to find more of these otherworldly creatures, and along the way he discovers the lost journals of one Benjamin Tooth, an eccentric resident of Mereton back in the eighteenth century. This latest publication from Mackenzie Crook and Faber, is that journal. The Lost Journals of Benjamin Tooth is, as the title would suggest, written in the form of a journal or diary. It begins on Monday 18th April 1768, with eleven year old Benjamin confidently proclaiming that 'one day I will be remembered as the greatest scientist that the world has ever known' before going on to tell us that 'Today for supper I ate of a buttock of ham with plum pudding and greens'. Whilst wandering on Windvale Moor, Benjamin spots what he believes to be an exceptionally large species of dragonfly. When he returns to make more drawings for his teacher he has a run in with the seemingly barking mad Farley Cupstart, a particularly odd and potentially dangerous character, and Benjamin's interests in the Moor are multiplied a hundredfold. Benjamin's journal continues on to 1780, in which time his life sees many ups and downs, and yet through it all Benjamin never loses his hunger for notoriety in the field of science. Through his journal we are introduced to a number of colourful characters, all of whom help take the edge off Benjamin's arrogance. He is not, you see, a particularly likeable character at times, so as a reader it is hard to root for him, but this doesn't matter as it is the sheer conceit and haughtiness that permeates through his writing that makes it so funny for us to follow. When I first received an email from Faber asking if I would be interested in copies of these two books, I was told that it probably wouldn't matter which order I read them. I decided to read the Journals first, and then moved on to The Windvale Sprites, and I really enjoyed reading them in this order. However, I think the stories would have been just as enjoyable if I had read them the other way around, so it really doesn't matter which one you pick up first. But please do pick them up and read them - they are both funny, whimsical stories full of old school, almost Blyton-esque adventure, but given a dark and occasiionally grusome edge. Not only is Mackenzie Crook an accomplished comic actor (his Gareth Keenan is one of my all time favourite sitcom characters), but with these two books he also demonstrates that he has a talent for writing as well. But that's not the limit to his talent either as both stories are accompanied by lovely black and white illustrations drawn by the author himself. 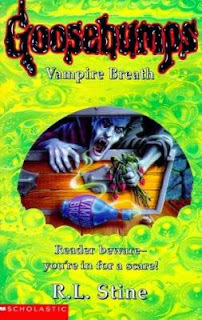 The Lost Journals of Benjamin Tooth was published in hardcover by Faber on 7 November, on the same day that The Windvale Sprites was published in a paperback edition. You can find out more about The Lost Journals of Benjamin Tooth over at http://benjamintooth.co.uk where you can also find details of an exciting competition. Come back here later in the week for your chance to win a signed copy of The Windvale Sprites. Today, as part of Under 14s Only Month, we are joined by blogging royalty - the rather brilliant Jenny whose Wondrous Reads blog is one of the most popular YA book blogs in the UK. Wondrous reads is my first port of call when I'm sorting out the book orders for school as my knowledge of books that mainly appeal to girls is very limited. However, Jenny doesn't just read and review YA as like me she is also a big fan of books for younger readers and so I was overjoyed when she volunteered to write a guest piece for my Under 14s Only Month, and even more so when she asked if she could tell us about her Top 10 Series for the Under 14s. I'm a big fan of U14 fiction so I was excited to hear about Darren's whole month dedicated to it. It's an area of children's fiction that can appeal to kids and adults alike, and a good chunk of it is hilariously funny and as entertaining as any YA or adult book. I've made a list of my top 10 U14 series by both UK and US authors, all of which I've read and can heartily recommend. I hope you find a new series to get addicted to! There are six books in this darkly comedic series and I love them all. I've never laughed so much while reading any book, and I'm still really sad that the series is over. It's narrated by a raven called Edgar, who looks out for the Otherhand family who live at Castle Otherhand. It's absolutely crazy but hilariously so. Marcus Sedgwick is a bit of a genius, I think! I couldn't write this post and not mention Harry now, could I? I won't ramble on too much because I'm sure you're all fans yourself, but I will say that surely this has to be the best children's series ever written? (Even though I've cheated a bit because the later books are darker and more suitable for older teenagers). I think epic is the word. (Book Zone edit: I am so pleaseed to see Harry Potter mentioned here. It annoys me when the series as a whole so often gets labelled as YA when the first four books are definitely aimed at U14s). 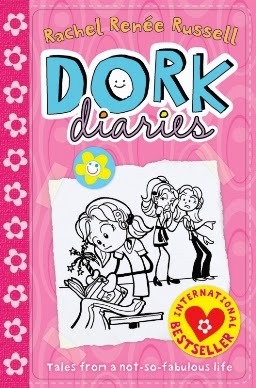 Dork Diaries is the best U14 series for girls that I've come across so far. 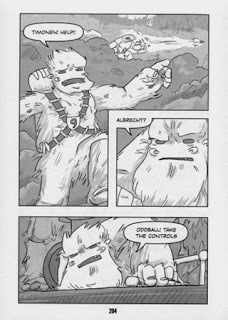 It's fast, funny and brilliantly illustrated by the author. 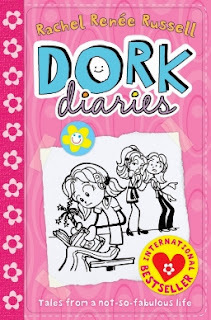 Just like Diary of a Wimpy Kid, it's written in diary format by Nikki, who chronicles her life growing up and encountering everything teen girls go through. I can't wait for the next book to be published! 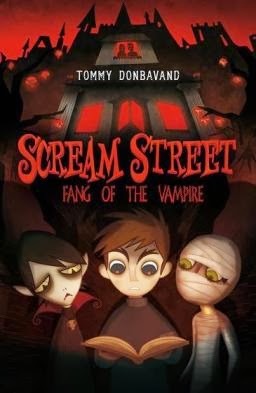 Scream Street is one of those series that I wished would never end. There are thirteen books in total, but even that isn't enough. This series is about werewolf Luke, vampire Resus and mummy Cleo. They're on a mission to retrieve six ancient relics left by the founding fathers of Scream Street, and each book is a fantastic supernatural adventure story. I'm a huge fan of the Rise of the Guardians film and was very excited to find that there's a series of books connected with it. They do differ from the film, but were written alongside it and tell the early stories of North, Bunnymund, Toothiana and the Sandman. They're action-packed and brilliantly illustrated, perfect for anyone who enjoyed the film and wants to know more about these fascinating characters! 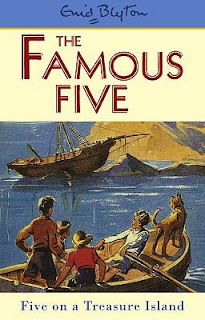 Enid Blyton's Famous Five series is another classic that's still in print today. I read these when I was little and basically devoured them faster than my mum and dad could buy them. Julian was my absolute favourite character, though I also had a soft spot for Timmy the dog. 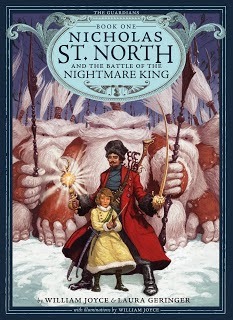 I think every child should read these books: they're the best adventure stories out there! 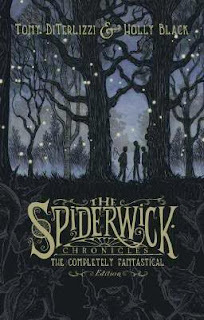 The Spiderwick Chronicles is a series I didn't read until a couple of years ago, but is one that I'm glad I tried. 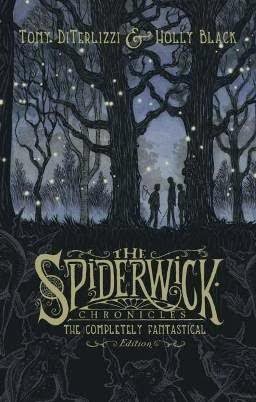 It's about faeries of all shapes and sizes, and what happens when the Grace children move into the old Spiderwick Mansion. Along with the faeries, there's also goblins and other such creatures. Brilliant! Goosebumps was my other favourite series when I was younger, along with The Famous Five. I've always been a fan of horrid, creepy stuff (vampires in particular) so this series was perfect. I haven't read any of the newer titles, though I read every single book in the original series published in the 90s. I still have a copy of Vampire Breath, which I may need to read again one day. Goosebumps is undoubtedly, in my opinion, the best horror series for children! Huge thanks to Jenny for writing this for us. I am ashamed to admit that there are a couple of series on there that I am yet to read, including The Raven Mysteries, which I need to get my hands on immediately. The Woebegone Twins is a tale of murder and mayhem, fact and fiction. The heroes are horrid. The plots are peculiar. And things are not always as they seem. If you prefer cleavers to kittens and fiends to fairies...then welcome to the gruesomely funny tales from Schwartzgarten. Under 14s Only Month on The Book Zone continues with the second book in Christopher William Hill's brilliant Tales From Schwartzgarten series, although this post will probably be more of a review of the two books. I picked up the first book in this series, Osbert the Avenger, in Foyles towards the end of 2012 but due to the huge number of books on my TBR pile it sadly remained unread for some time. I finally got around to reading it in September and totally loved it, and reading it so late meant that I didn't have to wait long for the next in the series to be published. 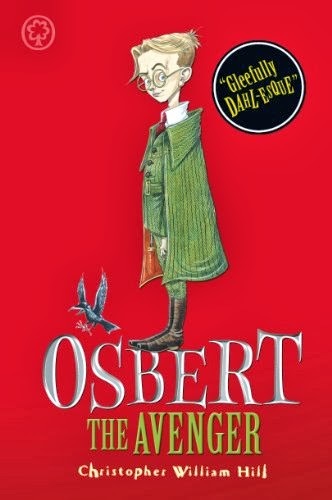 Osbert the Avenger is a truly dark comedic tale that could probably only ever be written by a Brit and the publisher, Orchard Books, recommend it (and its sequel) for fans of Roald Dahl and Lemony Snicket. 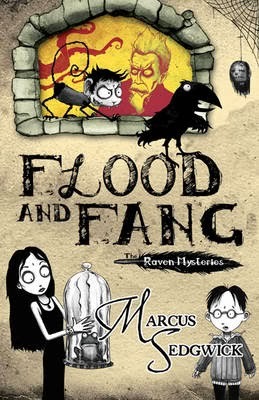 However, this book is far darker than any of the books by these two luminaries of children's fiction, and I would suggest that it has much more in common with one of my favourite TV comedy series, The League of Gentlemen, with a soupçon of Mervyn Peake's Gormenghast books thrown in for good measure. It is a gruesome and very funny tale full of the most fabulous, colourful characters, both good and evil. And then there is Osbert, who sort of falls between the two. Osbert is the anti-hero of the story, and after he is wronged by the particularly nasty staff of The Institute, Schwarzgarten's school for the incredibly able, he sets out to get revenge, and in the process accidentally commits murder. It isn't long before the staff of The Institute are dropping like flies, yet even though he has become a killer we still find ourselves rooting for Osbert, and guiltily wondering just how he is going to strike next. Some reviewers have criticised Osbert the Avenger for its seeming lack of morals, as Osbert appears to get away with his crimes, and does not face full punishment for the murders he commits. 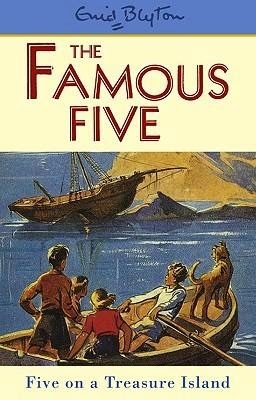 I'm sure I read one reviewer state that this shouldn't be likened to Dahl as the perpetrators of dark deeds in his books always got their comeuppance, although I personally can't remember George being punished for pretty much finishing his grandmother off with his marvellous medicine. However, I think kids will totally love this book for its sheer gruesomeness and will find themselves giggling wickedly as Osbert gets his revenge on the people who have wronged him and his family. It's a shame that some adults feel the need to become so holier than thou as soon as they read something that doesn't quite fit their ideals of what makes a good book for children. I guess there will be a few overly sensitive 9+ kids who might be a little scared by this story, but at the end of the day, if a child finds a book uncomfortable reading then they will invariably put it down and move on to something else. 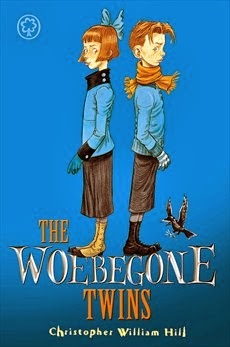 The Woebegone Twins is a sequel to Osbert the Avenger only because it is set in the same town, the wonderfully imagined Schwartzgarten. Beyond this, it is a totally new story with a completely new set of characters. Deserted by their parents as babies, Greta and Feliks Mortenberg have been brought up by their loving Aunt Gisela, who has always loved and treated them as if they were her own children. However, times are hard and therefore she is forced to take in a lodger, the seemingly sinister Mr Morbide. However, nothing is ever as it first seems in Schwarzgarten, but that doesn't mean that things aren't going to take a turn for the worse for Greta and Feliks, and a poisoned cake sees them orphaned and consigned to a grim future in the Schwartzgarten Reformatory for Maladjusted Children. Fortunately (? ), an angel of mercy in the form of glamorous children's writer Olga Van Veenen sweeps in to rescue them... but is it a case of out of the frying pan and into the fire. As I've already said, nothing is ever as it first appears in this town. The Woebegone Twins will not have the Daily Mail crowd clamouring for public book burnings as much as its predecessor might. It is still chock full of gruesome murders and despicable acts, but this time around the children are not the perpetrators, just the intended victims. However, it is just as funny and entertaining as Osbert the Avenger, mainly as a result of the author's dark and mischievous sense of humour. and I get the impression that they were probably almost as much fun to write as they are to read. Yet again we are presented with a panopoly of characters, and again the villains of the piece are one of the story's real highlights. 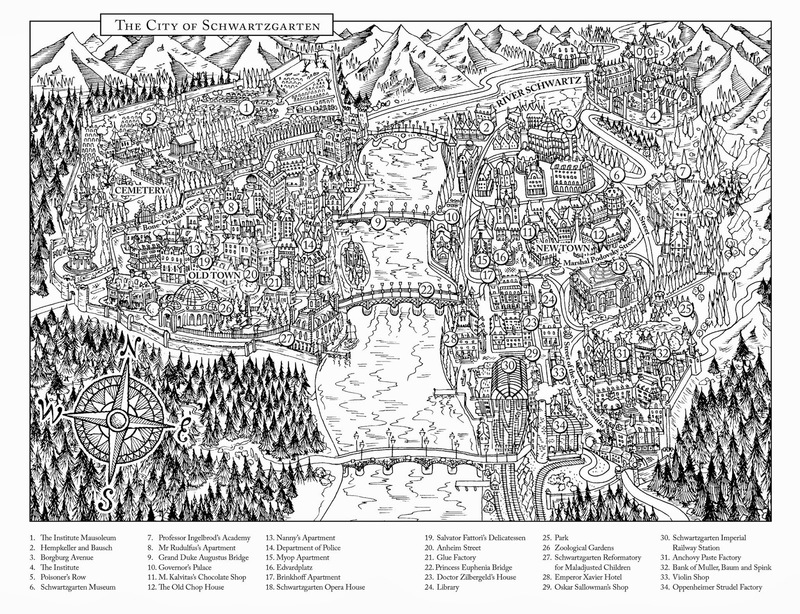 This is one of the stories where a location is as much of a character as the people who inhabit it, with Schwartzgarten being as dark, mysterious, and occasionally unfathomable as some of its population. However, in this episode the story does not solely take place within the boundaries of the city, and so we are also treated to a glimpse at the wider world that the author has created. I'm sure I read somewhere that Christopher William Hill has been signed up to write a further two Tales From Schwartzgarten books, and I can't wait to find out more about the town and its inhabitants. I can't sign off without commenting on the wonderful job Orchard have done in presenting these books. They come in a great hardcover (sans dust jacket), with the wonderful artwork of Chris Riddell spot varnished on the front and rear. 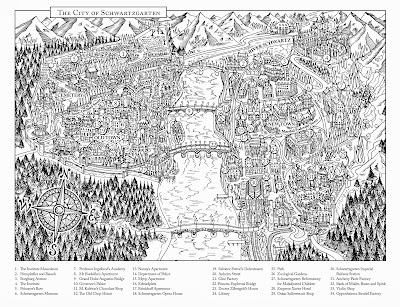 Both books have this glorious map of Schwartzgarten inside (click on it to see it in all of its glorious largeness), giving readers a great visual reference for the locations of the dark doings within the story. My only complaint - it would have been nice to see some of Riddell's illustrations inside the book as well to accompany the story. The Tales From Schwartzgarten books are pretty unique in my opinion, as I can't think of anything else for the 9+ age group that is as darkly comic as these two books, especially Osbert the Avenger. I'm wishing there was a lot more of this around as I have a thirst for it now and I'm not sure what to turn to next. My thanks go to the wonderful people at Orchard for sending me a copy of The Woebegone Twins to read. Bruno Pockley has a talent. A prodigious talent. But he's only just discovering its worth... When Bruno is sniffed out by a specially trained Trumpenhund as having world-class phartling potential, it's as if all his dreams have come true. Finally, his talent is being recognized! Then he and his classmates are taken to the court of the Knights Trumplar in the Kingdom of Phartesia, where they'll learn to play the ancient Phartlehorn for a performance of epic proportions. Starry-eyed, the children are determined to prove themselves to the magnificent Duke of Phartesia and his beguiling daughter. However, things are not always as they appear - and when Bruno and his friend Grace stumble upon the sickening truth about the Knights Trumplar, the wind is quite literally taken out of their sails. This is the first book in Under 14s Only Month that has a plot which relies heavily on a certain bodily function (the clue is in the title), but it certainly won't be the last. 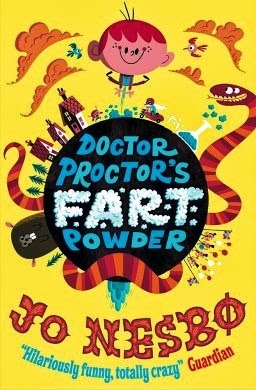 Sadly, I think there is an assumption amongst some parents, teachers and librarians that if a book is about farting (yes, be proud and say that F-word!) then it must be crude and unsuitable for kids. Unfortunately, this misguided and probably misinformed (don't judge a book by the F-word alone, at least read it before deciding whether it is inappropriate) will mean that it may not find its way into the hands of kids who will find it laugh-out-loud funny from beginning to end. I'm not at all ashamed to admit that even in adulthood I find a well timed or great sounding trump pretty damn hilarious, and so I guess there was always a good chance that I would find this book funny (I still find that scene in Blazing Saddles more than a little amusing). I think some people forget that the master himself, Roald Dahl, did not shy away from making good use of farts to add humour to his story in The BFG, and instead assume that children's literature is being dumbed down when bottom burps are mentioned in stories these days. Seriously? Can these adults not remember how funny it was when little Billy/Jimmy/add-name-as-appropriate accidentally let one rip in Miss (insert name)'s (insert subject) lesson at school? It's a fact of life that kids (both boys and girls, though girls are possibly less likely to admit it) find farts funny, and therefore are quite likely to gravitate towards reading a book that is clearly about this wonderful subject. 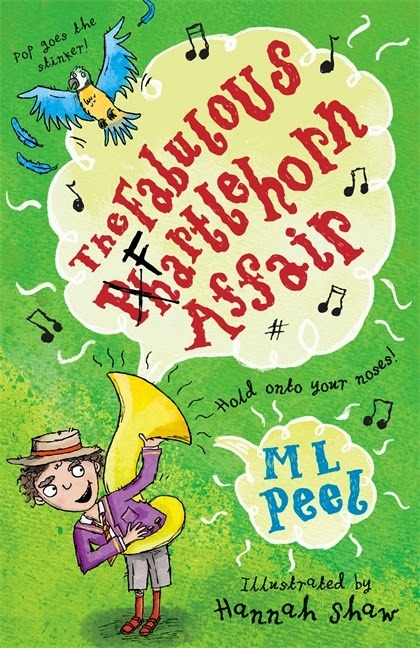 The Fabulous Phartlehorn is a delight to read, and author M.L. 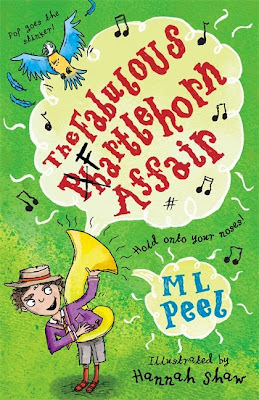 Peel (the M stands for Megan, by the way, before you go assuming that only a guy could write about these sort of things) takes her readers on a completely bonkers adventure, accompanied by a host of daft characters. It is not at all crude, but just very funny in a typically British kind of way. There is plenty here for younger readers, with the book read to them (complete with sound effects?) by a parent or older sibling (a perfect chance for families to read and laugh together), as well as having enough word play to keep older, more confident readers engaged. Scattered throughout the book are a number of illustrations by the wonderful Hannah Shaw (long time readers of this blog may remember that she also illustrated another Book Zone favourite series - Ivan Brett's Casper Candlewacks books). As ever, there are just enough of Hannah's illustrations to add to the hilarity of the story without ever distracting from the flow of the story (one of my favourites appears on pg 127, as Strudel, daughter of the Duke of Phartesia, demonstrates the playing of the phartlehorn with a look of sublime concentration on her face). I can't sign off without wondering out loud as to whether some of the inspiration for the story was the life of a very real Frenchman called Joseph Pujol aka Le Pétomane, whose story I first came across at the cinema, in the days when main features were preceded by a shorter film, in this case a short starring Leonard Rossiter as the eponymous bottom musician). Whatever the inspiration though, this book is well worth getting into the hands of an 8+ reader, reluctant or otherwise, but do be prepared to listen to constant giggling for the duration of the read. My thanks go to Liz Scott and Walker Books for sending me a copy to read. 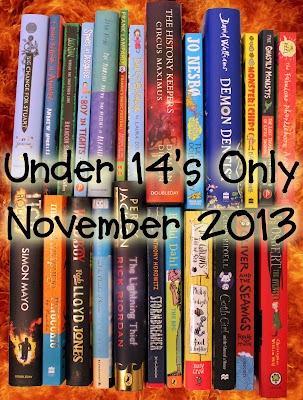 Some of my posts for Under 14s Only Month will be short reviews of recently published books that have not yet received a mention on The Book Zone. Some of my posts will be about books that have been around for a little or a lot longer, but are still in print and remain as personal favourites. This is one of those. 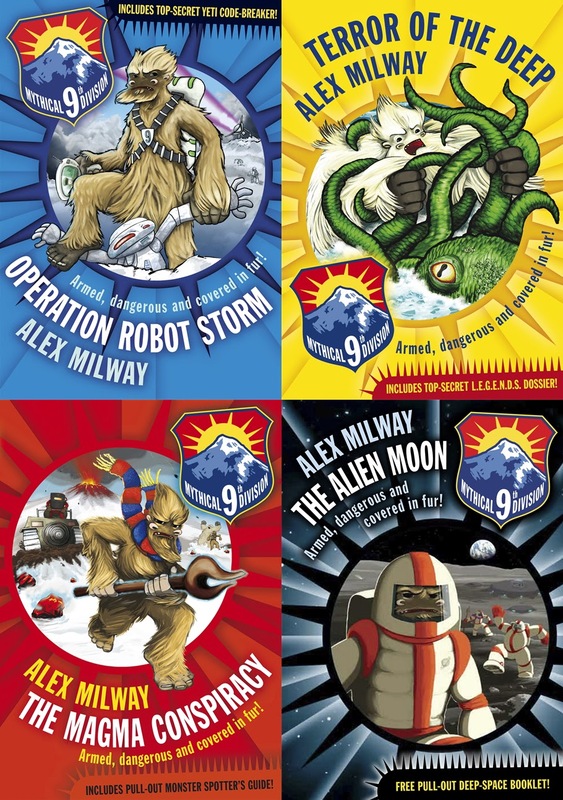 Back in November 2010 I wrote a review of the first two books in Alex Milway's brilliant Mythical 9th Division series, Operation Robot Storm and Terror of the Deep. Since then a further two books have been published in that series: The Magma Conspiracy and The Alien Moon. All four books follow the adventures of the members of the Mythical 9th Division, a team of three yetis that for the past 150 years have "existed as a top-secret branch of the British Armed Forces." 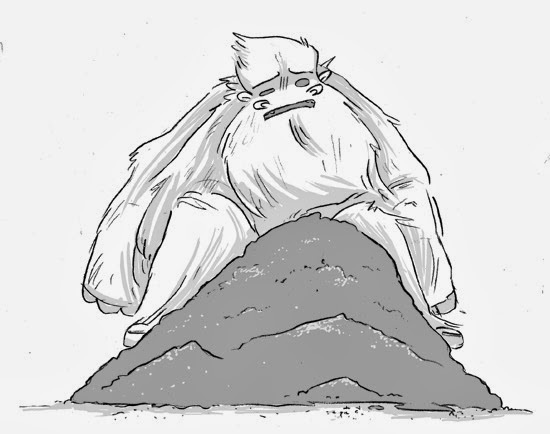 The yetis Albrecht, Saar and Timonen make up just one of nine divisions of mythical creatures, tasked with keeping the world's population free from the forces of evil. 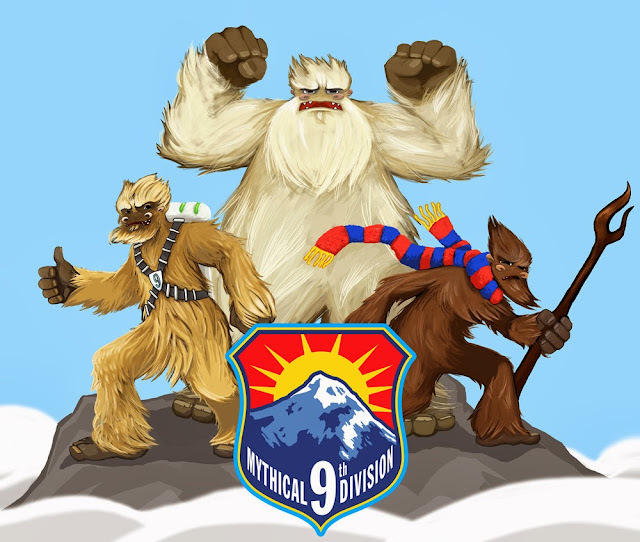 As their various missions unfold, we get to meet mebers of these other divisions, including The Bigfoot (Mythical 6th), The Kitsune (Mythical 8th) and the Yowies (Mythical 4th). In my review of the first two books I did not hold back from shouting about how much I loved them, and the third and fourth books in the series are more of the same brilliance. Why do I love this series so much? Firstly, they are perfect for readers aged 7+, with their mix of text and illustrations. Every chapter starts with four pages of comic-style panels, which are as much about moving the story on as they are about entertaining the reader. These panels are a stroke of genius and have the same effect as cliffhangers at the end of chapters - they make the reader want to continue turning pages to find out what happens next. Alex's illustrations are brilliant, and he spoils his readers as they do not just appear at the start of chapters as more illustrations are interspersed throughout the book. However, although the illustrations are what first catch the eye, the books are made even more special by the quality of Alex Milway's story telling. 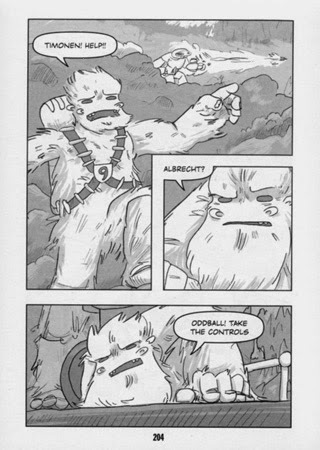 These stories are packed full of wonderful silliness, fast-paced action and adventure, cool gadgets, nasty Bond-esque villains, and, of course, my personal favourite aspect, the yeti characters themselves. 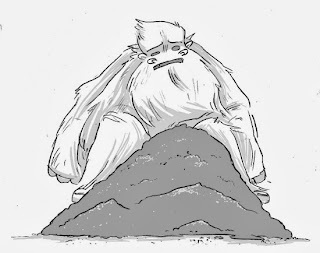 Back in November 2010 I described the three yetis as reminding me of a very hairy version of The A Team, as they bicker and argue their way through their missions, like a trio of brothers who on the face of it might seem to not get on, but deep down know that they would give their lives for each other. As readers we can laugh at their bickering and banter, whilst also appreciating the bond that exists between them. There is a great deal to love about this series, and yet sadly it has probably gone unnoticed by too many aged 7+ readers, and that is why I wanted to bring it to your attention in my Under 14s Only month. I'm not sure whether the series ever got published in the US, but I have checked and all four books are currently available to buy from The Book Depository so they are well worth checking out, wherever you may live. (edit: I have today been informed by Alex that the books have been published in the US this year by Kane Miller, so grab 'em while they're hot US readers). Over the past six months or so I've become pretty jaded with YA. That's not to say that I haven't read any stunning YA books in 2013 as there have been some absolute crackers, including: Department 19: Battle Lines by Will Hill, The Oathbreaker's Shadow by Amy McCulloch, ACID by Emma Pass and The Glass Republic by Tom Pollock. These are all very special books that I was very excited about reading prior to their release, and all have since become big contenders for my Book of the Year (except Tom as he won it last year). However, apart from this handful of YA books and a few gems, in 2013 I've been much more into books for the U14s (what our friends across the Atlantic would refer to as Middle Grade), and it really saddens me that books in this category do not receive the same level of press attention that YA books do (and I'm including bloggers in this). I'm happy to report though that several Twitter conversations in recent months have shown me that I am not alone in feeling this way. 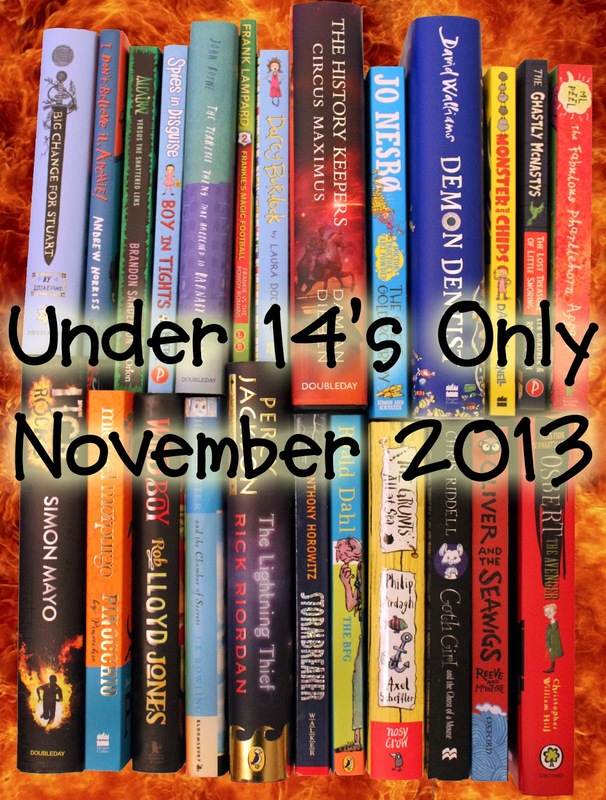 U14's Only Month was a feature started by my good friend Liz de Jager (ex of My Favourite Books blog and soon to be published writer), and it is with her blessing that I have resurrected U14's Only Month and brought it over to The Book Zone. If I can drag Liz away from her own writing for a few minutes I may be able to persuade her to write a guest piece for us at some point. We will also be joined by Sarah, another My Favourite Books stalwart, who has kindly offered to write a guest review for us (watch this space). I want to feature as many books for U14s as possible this month, so please do not expect my usual rambling and overly verbose reviews as these days work pressures do not permit me to write a month's worth of lengthy reviews. This is all about raising awareness of the huge number of amazing books for younger readers that are being published every month, but are often overlooked by the reviewing press.